Many franchisees make the mistake of sales forecasting based on their gut instinct. We understand it’s easy to do. Experience and intuition are invaluable when making sales predictions, but there are other, more reliable ways to forecast your QSRs’ future sales — and you already have them at your disposal. 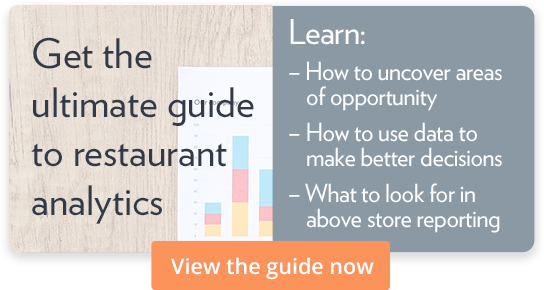 Here are three ways restaurant analytics make sales forecasting easier. This one is easy because you already track your daily sales. The more granular you can get with this data the better. Break down which days were popular last year. Were you open on Christmas last year? If so, were your sales really high or really low? That should help you predict when you should be open not only for Christmas, but for other holidays throughout the year. If you’re analyzing data and you notice a Saturday and Sunday in December reported far lower sales than a typical weekend during the busy holiday shopping season, but you didn’t report the weather, you may be scratching your head trying to determine what went wrong. Tracking everyday weather may seem unnecessary for QSRs, but it’s actually extremely beneficial to sales forecasting. That low-performing Saturday and Sunday in December aren’t as big of a concern if you report that it was the biggest snowstorm since the Halloween blizzard of ’91, because we know that severe weather, snow, or icy conditions deter people from leaving their homes. But don’t just report the inclement weather. Report great weather, too! Say it’s a 100-degree day in July and your QSR sells popular custard, frozen yogurt, or shakes. You may see a spike in sales that day. Had you not recorded the weather, you would be wondering what attracted so many customers to your store. Every community hosts a variety of social and schooling events throughout the year, and it will directly impact your QSR in one way or another. If the city hosts a St. Patrick’s Day parade right in front of your store and you sell a holiday-themed mint shake, chances are your sales may spike that day. However, if the local festival is hosted on the other side of town and includes food trucks, you’ll likely see a decrease in customers through the duration of the event. Much like tracking weather, documenting local events when they occur will give you insight into why your sales are high or low and will help you forecast for next year’s events. Even if there is no event taking place near your QSR, it may be smart to track holidays, too. If you’re located off the main highway between the city and a popular vacation area, you’re likely to serve more customers and see an increase in sales around Memorial Day, Independence Day, and Labor Day weekends as families travel out of town for vacation. Tracking numbers around these types of “events” will not only help you forecast sales for next year but help you schedule enough staffing, too. Of course, these aren’t the only analytics that help QSR franchisees forecast sales, but they’re largely beneficial in creating more accurate data-driven forecasts.